Nikan Restaurant uses their own specialised couriers to deliver their food. Barley, chicken, grated carrots and onion mixed with tomato paste and topped with fresh coriander. Grilled eggplant mixed with sauteed onions, garlic, fresh tomato and capsicum. Eggplant sauteed with garlic and mixed with walnut, whey yogurt (Kashk) topped with fried onion and dried mint. Chicken wings marinated with vegetables and spices. Herbed rice mixed with broad beans and served with slow cooked lamb neck. Rice mixed with green beans, tomato paste and minced lamb. Saffron rice mixed with barberries, sliced pistachio and sliced almond served with tomato based boiled chicken. Herbed rice mixed with broad beans and served with slow cooked lamb shank. Made with lamb or beef, chickpeas, white beans, onion, potato, tomatoes, turmeric and dried lime. Cooked in a small stone pot and dried mint served with bread. Crisp saffron rice cooked with yogurt and egg. Served with tomato based boiled chicken. Diced lamb, sauteed herbs (cilantro, green onion and parsley) cooked with dried limes, red kidney beans and seasoning. Served with rice. Mixture of yellow split peas, tomato paste, dried lime and well-seasoned diced beef and fried potato. Served with rice. Mixture of yellow split peas, tomato paste, dried lime and well-seasoned diced beef and fried eggplant. Serve with rice. Persian sweet and sour sauce, mixture of pomegranate paste, grounded walnuts and chicken tender and sauteed in butter. Served with rice. 1 x Skewer of Barramundi Fish marinated in special dressing served with herb rice. Fried Trout Fish marintaed in special spices and served with herb rice and salad. 2 x Skewers of Lamb and Beef Mince. 1 x Skewer of Chicken Thigh Fillet marinated in lemon juice and saffron. 1 x Skewer of Boned Chicken Kebab. 1 x Skewer of Mixed Lamb Back Strap and Chicken Fillet. 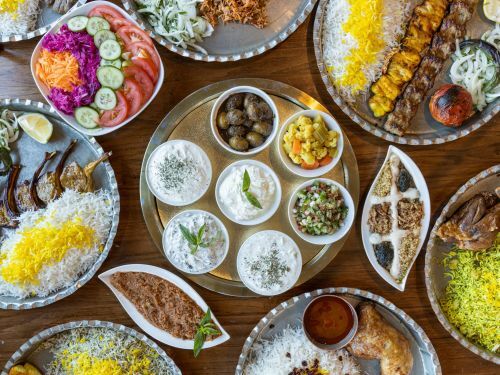 1 x Skewer of Joojeh and 1 x Skewer of Koobideh. 1 x Skewer of Lamb Back Strap. 1 x Skewer of Lamb Back Strap Pieces. 1 x Skewer of Koobideeh and 1 x Skewer of Barg. 1 x Skewer of Joojeh and 1 x Skewer of Barg. 1 x Skewer of Loin Chop. 1 x Skewer of Joojeh, 1 x Skewer of Koobideeh and 1 x Skewer of Barg. Diced cucumber, tomato and onion mixed with lime juice and dried mint. Lettuce, cucumber and tomato topped with Nikan dressing. Yogurt mixed with diced mountain garlic. Yogurt mixed with chopped cucumber and topped with dried mint. Yogurt mixed with garlic and spinach. Olives, pomegranate paste, walnut, olive oil, special herbs and spices.